Jam Class! Washington, D.C. 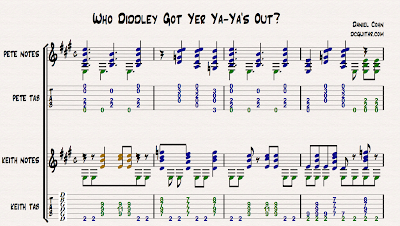 Guitar Lessons: Who Diddley Got Yer Ya Ya's Out? If you are like me, you've spent a good amount of your 'allotted daydreaming time' imagining what kind of chaos Keith Richards and Pete Townshend could stir up if they were put in a room together with guitars. Each one of these guitarists is capable of making more music than two decent guitarists put together. So putting these two masters of the telecaster together would be a delicate balancing act in what Keith Richards refers to as 'weaving rhythms'. I wrote a few bars of a Bo Diddley beat to flesh out what I thought this meeting of two of rock's greatest stylists might sound like. I attempted to notate their ability to play full, almost contrapuntal parts by showing two parts for each guitarist. Each plays a lower pattern or part in green, and a higher pattern in blue. Don't ask me why the first few notes of Keith's 'higher part' are orange. He's just funky that way. I'd recommend learning each player's blue/green parts separately, as well as learning their composite parts. Then, see if you can find a friend, or a loop pedal, that will play Keith's part while you play Pete's. Or Vice Versa. I personally like how Pete and Keith don't agree on the chord on the last beat. Keith plays things very fast and loose, so he'd probably play it different on the next repeat. DCGUITAR......... more essays dude! More autobiographical stuff on your development as a musician. Personalize this shiznit!!!!! Awesome lesson. But how is Keith going to play a part that requires him to use the low D string on his tele? Hee! You are absolutely right, Keith only has 5 strings much of the time. I thought of that while writing the lesson, but I have 6 strings on my open G Tele, so that's how I imagine it. Thanks for that cool link. One other thing to note: you'll want to capo at the second fret to pull off this Keith part.